Assistant Professor of Physical Therapy in the Arcadia University Pennsylvania, Janet Readinger joins the program to talk about their specialized community exercise program for individuals who are suffering from Parkinson’s Disease and Multiple Sclerosis. Janet Readinger is a physical therapist, an assistant professor of Physical Therapy in Arcadia Pennsylvania, the current Director of Clinical Education and the Director of the Dan Aaron Stay Fit Exercise Programs for people with Parkinson’s disease or multiple sclerosis. Janet received her Physical Therapy Master’s degree from Temple University and a DPT from Arcadia University. She is also an APTA Certified Trainer for the Clinical Instructor Education and Credentialing Program. Prior to joining the faculty full-time, Janet worked in inpatient acute rehabilitation at MossRehab in Philadelphia for 19 years. Neal Howard: Welcome to Health Professional Radio. I’m your host, Neal Howard. Glad that you could join us once again. Our guest is Dr. Janet Readinger. She’s Assistant Professor at Arcadia University in Pennsylvania and I’m going to let her tell us a little bit about herself and talk about some very very promising findings concerning a very special program that seems to be offering some very real benefits to folks suffering from Parkinson’s and other degenerative diseases. Welcome to the program, Dr. Janet Readinger. Dr. Janet Readinger: Thank you for having me. I’m honored. N: Well, I did say that you were associated with Arcadia University in Pennsylvania. Give us a bit of background about yourself. J: So I’m a Physical Therapist and an Assistant Professor and Associate Director of Clinical Education at Arcadia. I’m also the Director of the Dan Aaron Stay Fit Exercise Program which is an exercise program. It’s a community exercise class for individuals with either multiple sclerosis or Parkinson’s disease. N: These are very specialized exercise classes but I understand that some of these people improved mobility which is as far as I know in my limited knowledge, kind of unheard of once you have these diseases, they seem to progress in the negative. J: Yes. 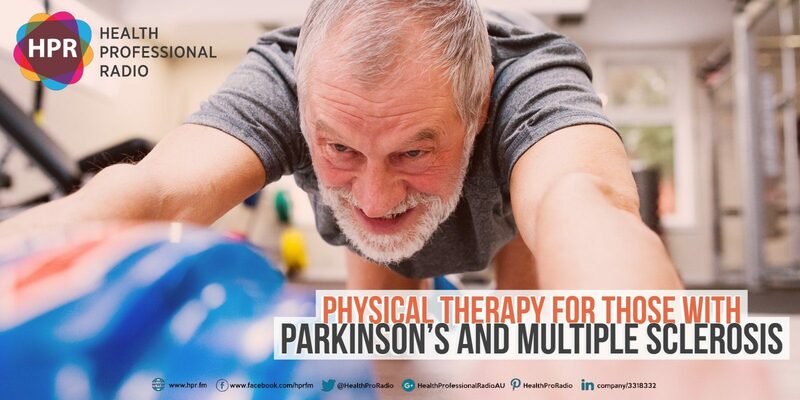 Both Parkinson’s disease and multiple sclerosis are chronic progressive neurological diseases where decline is unfortunately expected over time. We’ve been collecting outcome measures which are mobility-based for our program. For about three years, we collect them twice a year. We collect the five times at a stand, the 10-meter walk test, 2-minute walk test and timed up and go. So those are all mobility measures that are objective and shown to be reliable and valid for people with Parkinson’s and MS. And we’ve really found that some people are improving over time. So it’s been three years now. So that’s a significant amount of time for someone with a chronic progressive neurological disease. So some people are improving. The big majority of people in our group are maintaining their ability to perform those tests and a few people decline over time but we feel like we’re definitely beating the odds and stability is really a win for someone especially over a three-year time period with a chronic progressive neurological disease. So we’re pretty happy with the outcomes that we’ve seen so far. N: Well, just to clarify, put some things into perspective for our listeners. How do Parkinson’s and multiple sclerosis differ and how are they similar and that this program seems to be benefiting those two categories of people? J: So people with Parkinson’s disease tend to be very rigid. They have tremors. They tend to struggle with fatigue at times. They certainly struggle with balance and that’s one thing that both of those diagnoses really have in common. People with Parkinson’s tend to regress, just kind of in a linear fashion, kind of over time. They just kind of lose their balance gets worse. Their mobility declines. They may lose strength just from not doing things, not being able to move, not exercising. So it’s more of a disuse type of weakness. People with multiple sclerosis tend to have ups and downs. They have what they call exacerbation. So they have a period where their disease is very active and they tend to lose functioning after that and can improve after an exacerbation but over time they lose functioning but it’s more in an up-and-down manner with a trend toward decline. They also really struggle with balance. Loss of strength is part of the disease process or can be both diagnosis struggle with fatigue. Fatigue, especially for people with MS, can really be debilitating. There’s a research that supports that both of these patient populations can improve in their balance through exercise. They can improve in their strength through exercise and their fatigue levels can be influenced and improved through exercise. So we’re hanging our hat on that and really focusing our program with lots of we do. We incorporate aerobic exercise because that’s supported in the literature to be beneficial both of these populations. We include flexibility in our program in each class because people with Parkinson’s really struggle with rigidity. People with MS tend to have more spasticity which can lead to joint contractures. So we really focus on flexibility and strength training because both populations can really benefit from strength training and that can be related to falls and diminishing the number of falls that people have each year. We also include balance training. Each class has some type of balance work. The other thing that’s unique about our program is since we are associated with the PT program at Arcadia University, the PT students rotate through our class in the fall, in the spring semester and they actually assist us in running the class. They’re supervised by PTs but they can really add an extra pair of hands. They are able to individualize the work that we’re doing, the general program. They’re able to individualize it to each exerciser and it’s really beneficial. It’s a win-win for the student and the exercisers because the students really appreciate the types of things that people with Parkinson’s or multiple sclerosis struggle with and they learn how to guard people while they’re working on balance. They learn how to progress people when they’re with these types of diagnosis when they’re working on strength training. They learn just so many things about the disease process and individuals and the exercisers really get that extra attention and the hands-on that they need and enjoy actually. So it’s really a win-win for both. We also found that caregivers were kind of congregating in the hallway outside of our class while their family member was exercising with us and one of the PTs on faculty is also a counselor. So we decided to develop a caregiver support group that runs at the same time as our exercise class and we find that that’s a need that’s largely unmet in this population and we get really excellent feedback from the caregivers about the support group. N: As far as the support group and the feedback that you’re getting, how much are they saying that the unique aspects of your particular program and how they vary from maybe some other programs that they’ve been involved with? If at all, how it’s making things easier on the caregiver if they are living at home and not in a care facility? J: I think some of the things that they share are that people with MS or Parkinson’s, I mean in our class we have a really big variety of ability levels. So some people are still driving and working and exercising with us and other people are using a power chair for mobility and they’re no longer able to walk. So we have a really big variety and it can be scary for people. The more mobility they lose, the more at risk they are for falling. It can be really scary to exercise at all and there are barriers that to them accessing a regular gym or even doing some things on their own at home. So coming to our class, I think that the biggest feedback we get is that people feel supported and they feel safe, challenging themselves and trying to work on their balance or their strength training. We are able to assist them if they need it, to get on to some of our equipment like the cycle or the elliptical or leg press machine or whatever they might be using. So I think that’s the biggest thing is that they feel supported here. There’s also a real thing with camaraderie among the group. They’re very supportive of each other. I think people appreciate exercising and trying to move and challenge themselves around people who struggle with some of those similar things like balance and tremors, weakness, that kind of thing. So we hear that as well. N: Where can we go online and learn some more about the Dan Aaron Stay Fit Program and about what you do there as a physical therapist at Arcadia University? N: You’ve been listening to Health Professional Radio. I’m your host, Neal Howard. Transcripts and audio of the program are available at hpr.fm and healthprofessionalradio.com.au. Dr. Readinger, thank you so much for joining us today. Some great information and lots of promising results as well.